If I Can Do it Myself.....: A Pip! Now Just Waiting For the Zip. 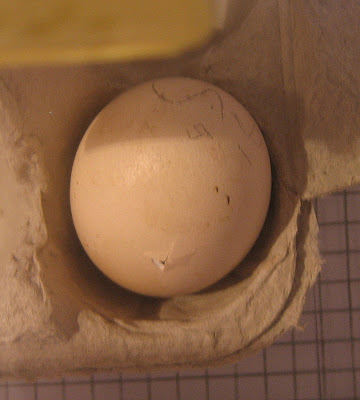 One of our dear little silkie eggs that I blogged about last week has pipped. We came home from Emma's 4H meeting and I noticed a wee little, almost discernible crack in one of the eggs. That is what's known as a "pip". Before we went to bed last night we were lucky enough to see the chick make the pip a bit larger while we watched. Now we are waiting on the "zip" which is when the chick pecks away the shell in a circle around the egg. The zip starts at the pip. Chicks will usually pip and rest for up to 24 hours before they start to work on the zip. So looking forward to seeing the little chicks. I have 5 chickens, one is an Araucana - gives green eggs when she's up to it. She is getting old, so not too many lately. The other 4 ladies are, to me, just the common brown egg laying chickens. They are lots of fun. Oooh, living the sustainable life. 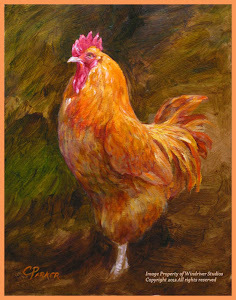 I wish I could do more, but chickens for eggs, making my own bread and dog cookies, are it for now. I do make all gifts I give, crochet, knitted, sewn or beaded - I do it all! What marvelous timing... can we join you in the zip watch? And only three days ago I looked in to buying fertile silkie eggs... just to see if such a thing is even possible. Now I am even more happy that "Caribou" came to Chickenblog. These are my first silkie eggs and my second experience with shipped eggs. Thanks for stopping by to to visit my blog. 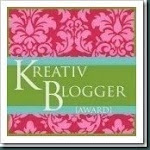 I've been blog surfing and I bet I went from oen of your blogs to the other's by the great links. I'll keep you gals posted! Can you guess what brought me over? My pipper is still a pip. We hit the 30hr-since-pip mark so I did the big no-no and took him out and chipped a bit of shell away because he wasn't making a sound or movement. But he is just fine, I placed him back and now he's slowly zipping. I have never had an egg take so long...I'm wondering if this something unique to silkies?? We have a new pip this morning..yeah! That little pipper eventually zipped completely around the egg...then died. I'm guessing from exhaustion? But the other two little eggs hatched with no problems and we are enjoying our new little silkie babes. I will make an entry on them as soon as I can.